LeBron James has read the scouting report on Ben Simmons and taken his defensive strategy against the young star to a new level. 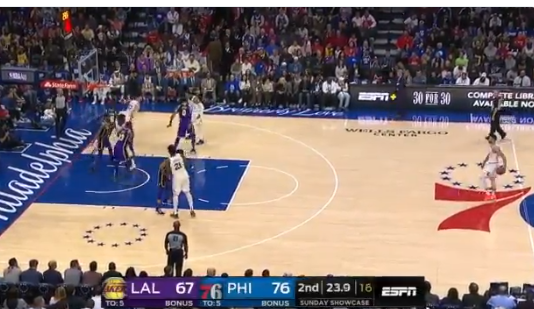 Simmons, who hasn’t made a three-point shot in his two-year career and scores nearly 80% of his 16.9 points per game in the paint, was left wide alone by LeBron during the end of the second quarter in Sunday’s Lakers-76ers matchup. James (for good reason) had zero faith Simmons was going to make a long-range shot and just chilled in the paint while the Sixers point-forward dribbled the ball up from half-court. The strategy worked as Simmons settled for a shot outside the key and missed. Defenders usually sag off Simmons from the three, but LeBron didn’t even bother trying to defend him at first – or anyone else for that matter. It’s also remarkable James didn’t get called for three in the key as he camped in the paint for nearly 10 seconds. Until Simmons can show he can score outside the paint on a consistent basis, defenders like James aren’t going to respect his scoring outside the post. It’s that simple. LeBron’s defense was appropriately lax.